The month of December had been very eventful for us. I've never felt so accomplished, or rather, truly savour the life of a Mother till the luxury of time gave opportunity. We had a lovely month that was lightly scheduled with classes, but with a schedule of fun. It's beyond words when I say sanity is taking a break from my Mama-taxi routine, slow down and enjoy time with the kids. It did mean I spent much more time with the kids! And honestly, I love it. We did vacation and came home rejuvenated. We got addicted to fun. We left the TV almost untouched because we've been out to play. One of which turned them into Star Wars expert. We were in for feasts and parties because Christmas was here. We read stories and the true meaning of Christmas. A festive beyond gifts and Santa. It was about the birth of Christ, the reason for the season. We opened presents one after another, with much thankfulness within. We were heartened by family and friends who kept us in mind. They knew Santa was made up, but we continued to play this year. Who doesn't mind extra gifts? with the frequent requests to pay at the self checkout counter. On those rainy days, we explored new board games. Sunny days, we hung out playing with bubbles and roller blades. Oh, it's one nice thing to watch them still amazed by short-lived bubbles. We shared endless hugs and kisses. Discussed about the right and wrong moral acts. We concluded, sometimes life is not always fair. and wondered where has the year gone. We are one evolving family. We discovered and re-discovered more about each other. With gladness, I smile at the beautiful memories we built and are building. We never looked much into time because our agenda was free. We shared more bedtime stories and prayers. We overran bedtime and time to rise. There was no better time to snug in bed. We played, danced and sang. We farewell our teachers and friends during the last school day. I had more opportunites to take glances at them. and that I love them more than anyone else. Not even the prince or princess they will meet some day. A Mother's love is never to be overtaken. Yes, I am one unique identity. Where love and fun shall abide. To serve God as a Mother is time well spent. While reflections should be a constant, I'm so overly blessed for these children heaven-sent, and for a beautiful month like this. To take time slow and be rewarded with a well-deserved break from the sometimes heavy laden routine. It was a great wrap to the year. We hope, you too, had a wonderful wrap to the year. Remember to slow down as much as we can, to savour Motherhood! Looking forward to a greater year ahead. Cheers to 2016! Happy New Year! And so we are back from a rejuvenating getaway. Any getaway that breaks us free from routines and schedules is all well worthed. Looking to update our travel soon. Just the week before we set foot for our travel, Js fell very ill. Jare was down with a week long of fever, followed by Jazz. The kids took turns to be in and out of school, while I felt almost exhausted running the roles of a nurse and a Mum. In midst of our battle, when sickie days show no mercy to what's in plan or scheduled, we got really caught and sometimes, I wonder if we really have to battle some events with a sick body. It's no brainier to know we should stay away from classes or events when sick, but sometimes it's more than just the usual. Js had enrichment classes to attend and Jazz had even much to cover in the month of November. She had a violin and graduation concert. Not forgetting the numerous rehearsals, as well as her usual violin, piano and swim classes in between. Everything swarmed up in the third week of November, I felt hectic and tired just looking at her. How did my 6 year old get so bogged down by schedule suddenly?!! I had to assure her that peaceful days are ahead. That week she was down, she had 3 important rehearsals to attend, 2 for her graduation and 1 for violin. We made the decision to skip 2 of the 3 rehearsals, which wasn't an easy decision for they were full dressed and photo taking rehearsals. And also, we needed to minimize contact with her friends, in case she was contagious. For that one rehearsal which she brought up her spirits to attend, I got a call from her teacher that her fever spiked. I packed medication and rushed down like a F1 driver to fetch her home for rest. On days which her fever didn't spike, I asked if she could make it for her enrichment classes. She positively and assuredly told me she could. I always admire her fervent attitude when it comes to learning. At the moment I thought, "Oh, great, we don't have to miss classes." I was overly concern about missing classes, forfeiting fees or having to arrange for replacement classes as next month is a month of vacation and relaxation. Really, I had wanted a schedule free month in December. We needed more play than anything else before a new school term begins. One of the days, I called my man in the office to update on Jazz's fever chart. He graciously and calmly told me, "forget about the classes. Let her rest." In midst of the sick chaos, I got shaken and got my mind cleared up. What a terrible Mum I've been. How could I have encouraged my daughter this hard on classes while battling a roller-coaster fever?!! Didn't we always talk about resting well, eating well and that health is wealth. Oh man! A sudden guilt poured over me, even though she was one little active girl, who was playing and eating relatively well. I started calling schools and teachers if I could do replacement classes, or miss a lesson without forfeiting fees. Some were understanding and one had to forfeit our fees. Anyway, I realised health is more important than anything else. Moreover, Jazz is usually a tough being who rarely falls ill. It's been 4 years since she last visited a Pediatrician. I knew this wasn't easy for her too. I got reminded, that I should teach them to rest and rest, especially when they are down. I got reminded, it really didn't matter about the classes they miss, but the priority of knowing that health comes first. In our often hectic life, grown ups tend to work and overwork even when they are extremely sick. Sometimes I just have to blame this on the herd mentality or our work habit. While we value achievements, we should not compromise on rest. It's some bad living example to our kids, isn't it?!! I think it's one habit and knowledge we can cultivate since young, that we should learn to nurse a sick body in order to face the battles and challenges ahead. But wait, if your child is down on a very important event of this lifetime, what would you do? Decisions and decisions. I was just glad she fully recovered and did so well for her graduation concert, which she practiced and rehearsed so diligently for. On another revelation, I've realised that the beauty of being a stay home Mum isn't really about being there for your kids, especially when they are sick. But that, it really is one great help when the man can focus solely on work, without having to worry about home or sacrifice any leaves to send them to the doctor or be home with them. There's this firm assurance that his wife, the kids' Mum and probably the best caregiver for the kids is home with the unwell kids, and that they are in good hands. It's true when we say, there's a woman behind every successful man. Yay, I proclaim that! Parenting is often so picture imperfect. When we thought we know what to do, we are actually doing it wrong. Love how new revelation shapes and reminds us of our parenting values. So people, rest well and rejuvenate well for the coming battles ahead. Let's not over-exhaust and always remember to rank health before wealth. We explored options to head out of the resort and the only way out was by taxi or rental car. There was no free or paid shuttle bus service to bring you out. Pasar Oleh Oleh, a little shopping village which I googled to be nearby has closed down. Instead, a new 'mall' standing nearby is Plaza Lagoi, about a 15 minutes drive from the resort. But don't expect much if you're visiting anytime soon. It opened its doors early this year with only a few shops up and running. A touristy attraction, so not any much cheap deals in there. We were firmed about getting out of the resort since no other activities appealed to us. We opted to rent a car out for 8 hours. Their rate goes bi-hourly. We were initially skeptical about car rental as none of us knew the roads, no GPS and no idea of how traffic would be like. Worries uncalled, we found that their rental car comes with a driver. 8 hours, a 7-seater car and a driver at $120. We paid and zoomed off. Quite fast and furious with our assigned driver. After a touch and go at Plaza Lagoi, we requested to roam the heart of Bintan, Tanjung Pinang. About a 90 minutes from the resort. Along the way, our driver did a short stopover at a temple, Vihara Avalokitesvara Graha. I stayed in the car as Js were sleeping, while the rest stepped out for some sightseeing. We continued our journey to Tanjung Pinang after a short stop. City where we caught glimpses of the local bustling life. If shopping is on your mind, this place unlikely to please you. Or perhaps, my shopping mode wasn't on. Prices were cheaper and there was quite a large number of Chinese population. So yeap, some shop owners can communicate in Mandarin. We did some street walking and whacked food from the street stalls. Went for the hot food just to be sure our tummies could handle them. We tried some peanut pancake which was surprisingly delicious. Seemed to have defined the taste of simplicity and authenticity. $0.40 per piece. Only. We stopped by another stall that sells fried finger food. Oh yes, spotted goreng pisang (Fried banana fritter). Hot and cripsy! $0.30 per 3 pieces. It's been such a long time I last ate it in Singapore. Nowhere quite seen now. So what we had needed to do with our food desire, was to pull off a piece of newspaper they've neatly prepared and pick out our wants on it. They will sum it up and bag it for you. How do you view this? I had never really like laying food on newspaper, so this was quite an interesting 'idea'. We followed along. How did I begin to appreciate NEA for regulating food hygiene in Singapore?!! Life there may be a little backward, looking like the days of 1950s or 60s. Simple and delightful, with nothing fanciful or luxurious. I tried defining simple joy to Js while walking down the streets. It was an eye opener for us, as travelling has always been modern and beautifully exciting for us. The World for exploration is endlessly huge. We strolled for about an hour before meeting up with our driver again. Though the setting up of night food stalls were almost visible, we decided to move off with our initial plan of kelong seafood dinner. Before moving off, our driver asked if we were keen in batik clothes. Looking at some spare time left to dinner, we agreed. We were brought to the nearby, Tanjung Pinang mall to shop. You might enjoy some shopping in this 2 storey mall. We didn't explore much as the first storey caught most of our time. Js got shoes, while I bought slippers. Bata seems cheaper in there. There were also fast food, supermarket and some kids entertainment in the mall. We were genuinely ready for dinner after some slight shopping. The tummy calls and off to kelong we go! But then, though I had a kelong in mind, we were counter offered another by the driver. Aah, it flashed my mind that he might benefit from bringing some customers there. Oh well, we are always kind and sometimes, obliging. We found he could get his meal free at the kelong he recommended, when we asked him to join us for dinner. After about 30 minutes drive, we landed at Ciu Yong Seafood. We had much reservation about the restaurant, we doubted much on price and transparency. It was also empty and quiet at our time of arrival. Arriving after the sun set didn't help, its surrounding was near pitch dark. Nonetheless, we were hungry and needed food. The food tasted pretty average with a few excellent dishes. Seafood is undoubtedly fresh as it came straight from the water. We had some good fresh prawns and a Garoupa fish which was a little over steamed, else it would be perfect. We ordered huge cockles with sambal (their sambal is spicily awesome), but a pity it was overcooked. It was most uncomfortable when we saw no prices on its menu, we had to asked the price before ordering. Glad that they initiated to checked our orders with written prices before sending into the kitchen for preparation. So our 'million' dollar rupiah meal ended up to be about $140. Not exactly a cheap deal for an outskirt kelong. Perhaps, it might be more comforting to visit when the sun is still beaming. I'm sure it has quite a spectacular view around it. The meal filled us and summed up our day. We were brought to one final stop near our resort to get layers cakes, or kueh lapis. Not a regret, because they were so good! We bought the original and coffee layers, which I heart the coffee flavour very much. A unique taste indeed. Other local products like luwak coffee can be found there too. So yeap, our adventure ended that night. And we were all ready for check out the next day. We finally got a school bag! Going onto P1 keeps some parents scrambling on their hands and feet, especially the last minute planners. I am usually in this category, but wait, I think we're almost well prepared. We've got orientation, school books, stationery, shoes and socks checked off the list. It was only recent week that we decided to slim the options of school bags. 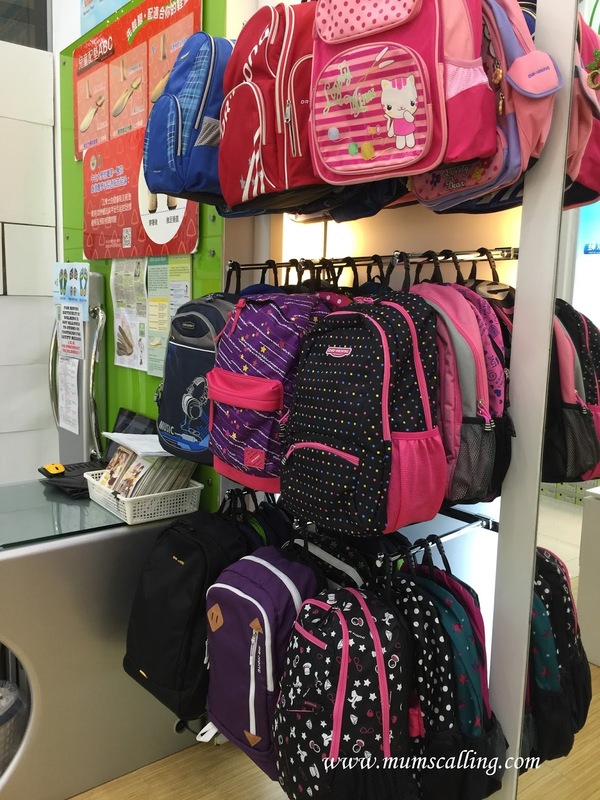 The varying bag choices in the market got us so torn. I wasn't keen in any ergonomic bags for they come naturally heavy. And these kids don't spend much time having their bags on their back. Unlike my days of having to carry books and bag onto public transport with no seats. And nah, they're won't be hiking with their school bags either. So really, I had thoughts that any bag will do. We explored around and came by Dr Kong. A pressure-free bag that is surprisingly lighter than many others in the market. There wasn't any proclamation of its weight, but I did a weigh on our scale. It was about 800g for its small size. Perfect! I thought. Our confirmation doubled up when we saw the various designed it offered. They weren't overly kiddy or mature, just nice for little school goers. Ok, it really didn't matter on my liking for it, but the carrier has to love it. I had Jazz in tow with me to pick her preferred design in store. There were some cartoon designs which I think are good for preschoolers, but there were also some in between. Neither too cute nor mature. Went through a few and felt that these were some that were aesthetically soothing to my eyes. 1. 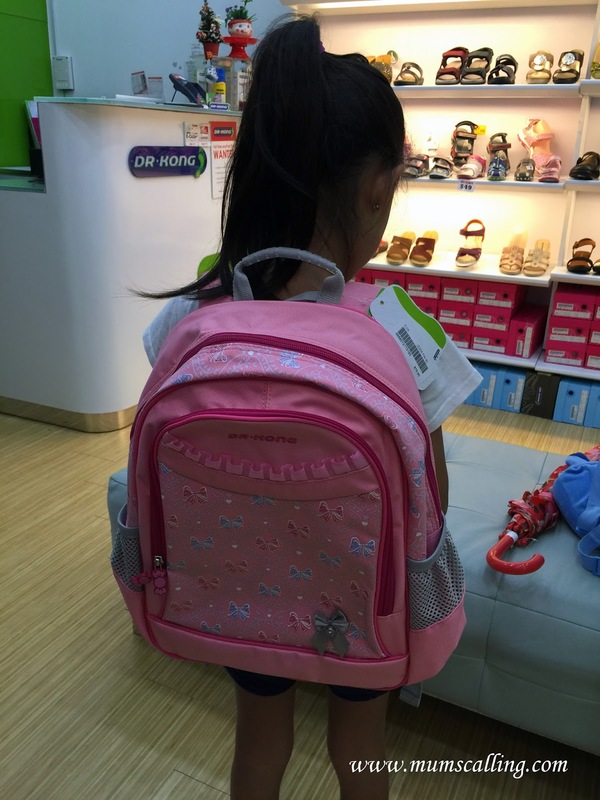 Dr Kong's Small sizes bag are of good fit for children below the height of 1.25m. It's highly possible that Jazz will have to change to a larger bag when she grows beyond that. 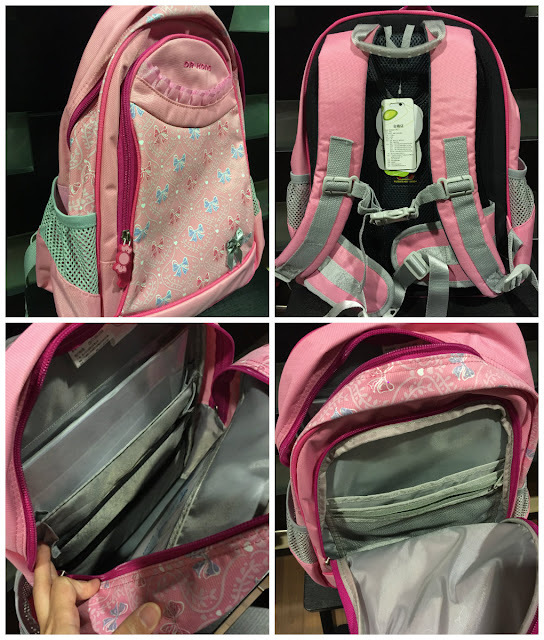 Some parents may not like the idea of this investment and return, but I really love that the bags are catered and designed to achieve its maximum function. Which means it won't look oversize on petite school goers. But if your child is near 1.25cm, it might be a wiser choice to go for their M sizes (1.25cm to 1.49cm). 2. Their designs are appealing. Not that there's a huge variety to select from, but a few of them were pleasing. It's quite a toil to carry a bag the kids don't like and having to greet it every weekday morning. Even before the sun greets them. So yes, it's important to bring your child along to try on and choose. 3. It has a firm internal frame that helps spread weight evenly from shoulders to pelvis and keep books close to the back. The weight distribution is perfect for avoiding any strains or possibility of hunchbacks. 4. Adjustable waist strap to help share the weight of the books. There's another strap for the chest, but I didn't think that would be necessary. 5. A firm base that doesn't droop the books when carried and able to stand on it's own on floor. 6. Not overly priced. $79.90 for S sizes. Discount available for Mum's calling readers (scroll below)! Jazz was recommended a few designs by the store's friendly staff. It wasn't too long before she got her pick. I'm glad we met eye to eye on her chosen design. And if you are concern about light coloured bags turning dirty over time, psycho your child to go for a darker colour. She fitted on and I knew was just perfect. She wasn't looking like a Teenage Mutant Ninja Turtle, I could see her neck! The bag wasn't overly high. And it comes in good layers of compartments. The secret and not so secret compartments. Knowing them well just so I know how to inspect her bag at times. Haha. So yeap, it's one of the many options for your consideration, if you haven't gotten a bag. More designs have flown in on 08 December. Good to pop in now. 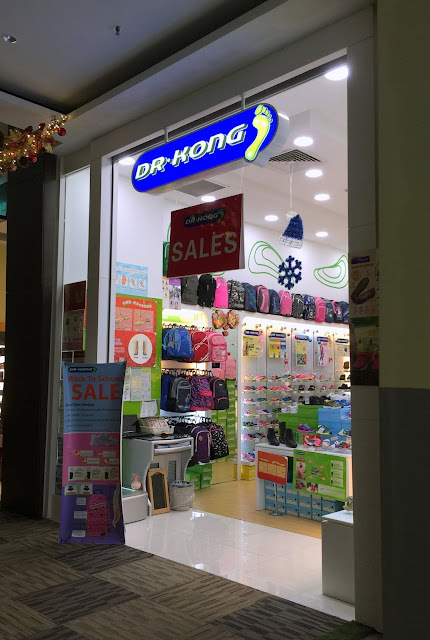 Mention 'Mum's calling' at any one of the stores for a 10% discount off any Dr Kong's bag. Till 04 Jan 2016. That's now one off the P1 checklist for us! Disclaimer: A bag was given for the purpose of this review. All photos and opinions are solely ours.